Harriet Quimby was the first licensed American female pilot, first female pilot to fly at night, and first female pilot to fly across the English Channel. No matter the story, Harriet Quimby lived on a farm with her family in Michigan until it went under, and they, like many families during this time period, headed west. By the turn of the century, the Quimby’s had made a life for themselves in San Francisco, California. The West Coast had really begun to bloom into the cultural Mecca that it is today, and Harriet found herself enamored by the dream of becoming an actress on the silver screen. Even in her younger years, everyone found Harriet to be charming, funny, and beautiful. The go-getter mindset instilled in Harriet by her parents soon grew into an ambitious tenacity, and combined with her immersion in the new and stereotype-defying world of California women, she soon became preoccupied with the fast-paced world of journalism. Harriet picked herself up and headed to the Big Apple, the center of American journalism. By 1903, she was working as a theater critic and photojournalist for Leslie’s Illustrated Weekly, where over 250 of her articles, and many of her photographs would eventually be published before she moved on to bigger and better things in 1912. By 1910, bolstered by the success of aviation pioneers like Glenn Curtiss and the Wright Brothers, flying fever had begun to grip the nation. Glenn Curtiss was again crowned the “King of Speed” after he won yet another air race, Lincoln Beachey made the jump from dirigibles to heavier-than-air flight, and William Randolph Hearst, newspaper magnate and founder of, among other papers, the Los Angeles Examiner, attended and advertised for the first American hosted international air meet. It’s no wonder that Harriet Quimby herself succumbed to the wonderful addiction that is aviation. In addition to capturing her interest as a reporter in search of the next big thing, Harriet was attracted to the challenge of learning to fly an airplane, which in fact she said appeared, “quite easy. I believe I can do it myself, and I will.” Hailed as a spunky tomboy in her youth, Harriet was always excited to one-up the boys whenever she could; an admirable trait that would stick with her throughout her life. 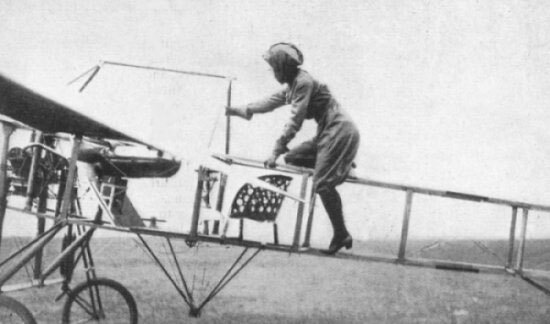 Harriet Quimby climbing into a training monoplane. So, in 1910, Harriet headed back across the United States and quietly enrolled at the Moisant Aviation School at Hempstead, Long Island, New York. Her flight instructor, Andre Houpert, saw both the determination and hard work Harriet had poured into her dream of flying, and let her take her first solo flight after just 4.5 hours of flight in the school’s 30 horsepower Blériot monoplane. Those 4.5 hours were in addition to 33 ground lessons which spanned four months, and after Houpert very clearly saw Harriet’s talent for flying, encouraged her to try for her pilot’s license. Because of the cultural resistance to women entering the “man’s world” of aviation at the time, Harriet had to take her lessons at dawn and wore a disguise which included a suit and face-concealing hood while flying. During this time period, a pilot would have to land their plane within 100 feet of where they took off in front of two judges from the Aero Club of America (which is now the National Aeronautical Association) which was certified by the French Fédération Aéronautique Internationale. Compared to today’s standards, this seems impossibly unfair. Due to the lack of altitude specifications, this seems like a long hop more than an actual flight, but I digress. Regardless, Harriet’s first attempt did not bode well, and she fell too short to be awarded her license. The next day, however, Harriet managed to set her monoplane down within 7 feet and 9 inches of the line, and was awarded license number 37, making her the first American woman, and the second woman in the world (after Raymonde de Laroche), to earn her wings. The secret of her femininity was revealed very shortly after she earned her pilot’s license, as she was then invited to join the Moisant International Aviators, a flying exhibition team. The first time Harriet Quimby made headlines, as opposed to writing them, was by making a moonlit flight over Staten Island, before a massive crowd of 20,000, becoming the first woman to fly at night. She continued flying shows with the Moisant International Aviators, and in September of the following year, Harriet beat the leading French aviatrix, Helene Dutrieu, in a cross-country race. By this time, Harriet’s secret was out, and even her employers at Leslie’s had openly accepted their employment of a trend-setting firecracker. Mathilde Moisant, the sister of the late John Moisant (founder of the Moisant Aviation School), got her pilot’s license shortly after Harriet, the loser in a light-hearted competition between the two. In October of 1911, the two American aviatrixes teamed up for a flying tour of Mexico (and became the first women to fly over Mexico City) to honor the inauguration of President Francisco Madero, which Harriet would write an article about for Leslie’s Illustrated. Harriet had hit her stride as the cover girl for American aviatrixes. She styled her hair in the most fashionable of ways and chose to wear a vibrant violet satin flying pantsuit, again opposing the gender stereotypes strictly enforced during this time period. By this time, Harriet Quimby had set her sights on gaining another record for women aviators. Due to the extremely limited navigation technology available at the time, combined with the flimsy-at-best airplanes, it was considered to be highly dangerous to fly across open water for any length of time. Even more dangerous was flying across open water as turbulent and treacherous as the English Channel. Before, and even after, Louis Blériot safely made the flight on July 25, 1909, many aviators died during their attempts to cross the 22-mile wide channel. The winds, dense fog, and less-than-reliable technology made even Harriet nervous. Harriet had built herself a reputation as a safe and meticulous pilot, even writing an article about avoiding the dangers of flight, emphasizing the importance of pre-flight checks and the necessity of checklists. But no woman had even dared to attempt the flight across the English Channel, let alone complete it safely. In March 1912, Harriet set sail for London and soon hopped over to Paris, France, to meet Louis Blériot himself. She arranged to buy a new 70 HP Blériot monoplane, and in the meantime, flew a borrowed 60 HP Blériot monoplane. Due to a period of poor weather at the airfield in France, where she was supposed to be practicing, Harriet traveled back to London, where she met British pilot, Gustav Hamel. She confided in him her plans to cross the Channel, and Hamel, who had flown the trip himself and was familiar with the dangers, decided to help her as a test pilot for the new 70 HP plane, and act as a technical advisor. Harriet had never even used a compass before, and Hamel, who warned her death was assured if she got lost in the fog and flew out over the North Sea, taught her how to pay constant attention to her heading while flying. In April 1912, as the date of flight attempt approached, Hamel himself grew nervous, even offering to dress up in Harriet’s bright purple flight suit and trick the viewers into thinking she had made the flight. Rightfully offended, Harriet refused and continued training in the 60 HP Blériot monoplane. She nosed down to find a safer altitude for the monoplane, which flooded the carburetor and caused the engine to misfire. Luckily for her, however, the plane was determined to survive and began to sound normal again, allowing Harriet to continue her flight. An hour later, Harriet arrived in France. She spiraled down for landing on a sandy beach near Hardelot, France, and was greeted by a crowd of villagers, who welcomed her to France as the first female pilot to cross the English Channel. Over the next few months, Harriet would continue to revel in her new-found fame, and competed in air shows and exhibitions all over the United States. Harriet Quimby in her stylish purple satin flying suit. In June 1912, Harriet Quimby headed to the East Coast to compete in a Boston air meet. After a successful day of events, the organizer of the event, William A.P. Willard, and his son, Charles Willard, a Curtiss exhibitionist pilot, had flipped a coin to see who would go fly with the Queen of the Air in her new 70 HP Blériot plane first. Charles had won, and after they safely returned from a flight around the Boston Harbor, it was William’s turn. The plane descended into a steep spiraling turn before suddenly, it’s nose dropped dramatically. It began turning to the left. William was thrown from his seat over the nose of the plane, and Harriet followed only seconds later. The two figured plunged into the shallow water 1000’ below, which, at low tide, was only three feet deep. They both died on impact. The plane resumed a glide, and lodged itself into the muddy bank, suffering only minor damage. Lydia Litvyak was born with a rebellious spirit and found her way to a local flying club at the age of 14, soloing for the first time at 15, and graduating from the Kherson military flying academy shortly after. By then, she had a serious obsession with flying and had become a flight instructor at the nearby Kalinin Air Club, where she would train over 45 new pilots. Though the cause of the accident was never conclusively agreed upon, one of the first to arrive at the scene, Earle Ovington, a pilot, saw that the rudder control wire was caught over the lower end of the vertical control lever, which “unquestionably” caused the turn to the left and the sharp downward pitch. Dozens of experiments within the aviation industry followed to try and discover how the crash occurred, and prevent future catastrophes of that nature, but none were able to determine the true cause of the crash. A machine of this type has not the slightest degree of automatic longitudinal stability and … is an extremely tricky and dangerous type to handle. The horizontal tail should act as a stabilizing damper, preventing the machine from either diving too steeply or stalling and not under any circumstances as a lifting plane… it must be either a flat or slightly negatively inclined surface. Regardless of what caused the tragedy, the deaths of Harriet Quimby and William Willard sent a wave of despair through the aviation community. Such a vibrant, intelligent, and charming young woman, as well as an aviation pioneer and feminist icon, was a loss whose effects could not help but be felt, even today.